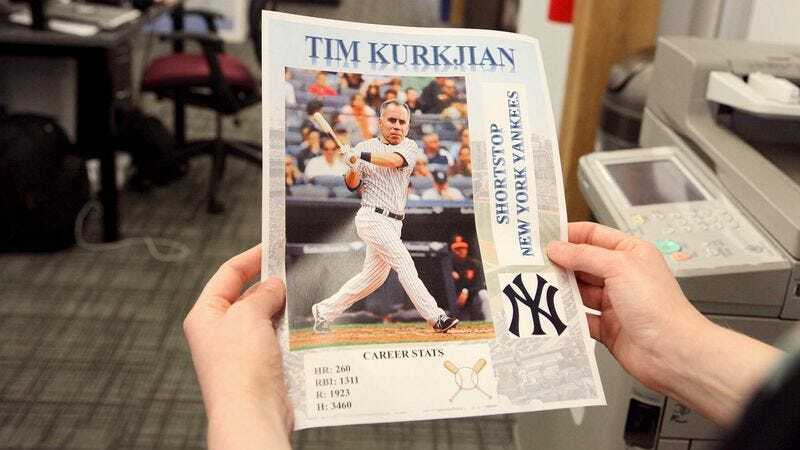 BRISTOL, CT—While looking to retrieve several pages of research notes for an upcoming broadcast of SportsCenter, ESPN anchor Linda Cohn confirmed Thursday that she found what appeared to be Tim Kurkjian’s design for a baseball card of himself sitting in the office printer. “He clearly cut his head out from another photo and put it over a player’s body, and it looks like he just made the whole thing with text boxes on Microsoft Word,” said Cohn, adding that the double-sided, full-color printout portrayed Kurkjian as a shortstop for the New York Yankees with 260 home runs and a .277 batting average. “He copy and pasted the Topps logo on the back, and he even included this little bio that talks about his off-field hobbies and refers to him as ‘a true five-tool player.’ I’m going to do him a favor and just toss this before anyone else sees it.” At press time, Kurkjian was anxiously walking around the ESPN offices and asking if anyone had picked up anything of his with their printouts by mistake.